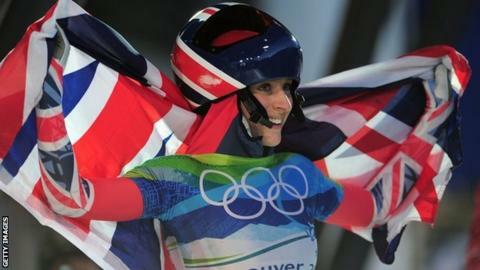 Olympic champion Amy Williams is confident Great Britain's women can claim two medals at the 2013 Skeleton World Championships. Williams, 30, has now retired from the sport but believes in the current crop. Lizzy Yarnold, Shelley Rudman and Donna Creighton will compete in the event, which begins on 31 January in St Moritz, Switzerland. "I see no reason why we can't have one, if not two, Britons winning world championship medals," said Williams. The 2010 Olympic gold medallist believes Rudman's experience of the track in St Moritz and Yarnold's World Cup gold medal at the same venue in 2012 will help. "For me Lizzy Yarnold has been an amazing athlete. She has come in and made a big impact," said Williams. "She has a lot of potential to be really consistent at the top of the world and to be able to medal. "Shelley has always performed on this track and always had great results here." The World Championships will be a good test event for the 2014 Sochi Winter Olympics as the athletes will compete over two days, just like in the Games. "It will be the only race they have with four runs. They can go into it pretending it is like the Olympic Games," added Williams. Williams will not be defending the gold she won in Vancouver in 2010 as injury brought an end to her career in 2012. "My retirement decision was a hard one to make. I struggled with back injuries. My doctors were keen for me to give up after Vancouver. I was not ready to give up. I was asking for painkillers," revealed Williams. "I felt I could give more to the sport, I was still learning and could get medals for GB. But I had to weight it up with my health. I was at peace with my decision."